The Rufus / Nature Biotech VC investment map. Is there an "Entrepreneurial Personality"? Intellect or Imagination: curious, interested in new ideas and experiences, preference for novelty vs prefers the predictable. The Big Five are quite stable over time, and are believed to represent fairly basic aspects of how we behave. We know what a successful entrepreneur will be, of course. Extravert, probably rather un-Agreeable, Conscientious, Imaginative, and of course have enormous Emotional Stability to cope with the roller-coaster of start-up life. Except that that turns out not to be the case. 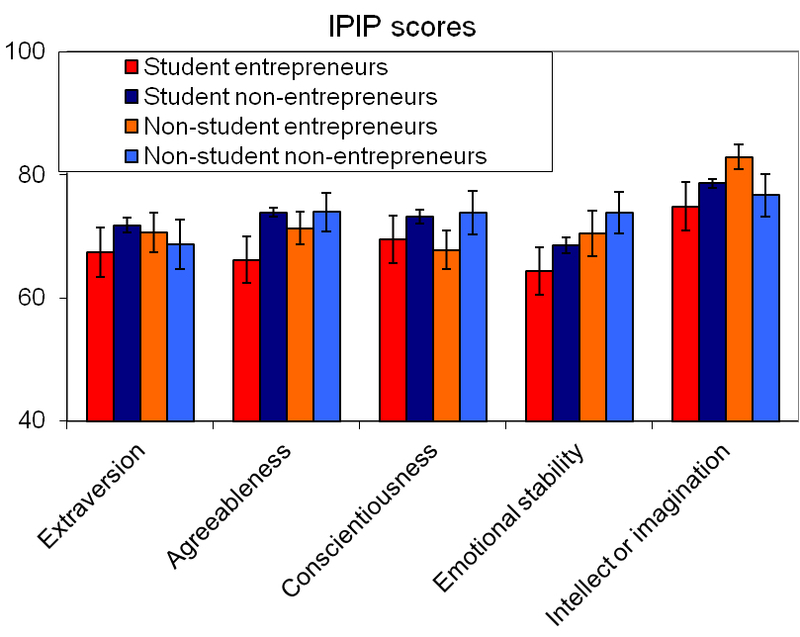 I did personality tests on 137 male and 116 female students in my MBE programme course, and on a 37 member 'outgroup' of non-students, and classified them on the basis of their career as to whether they had done anything entrepreneurial. I profiled their personality using the IPIP questionnaire. The numbers for the Big Five dimensions are not comparable - if I have an Extraversion score of 70 and Intellect or Imagination of 75, it does not mean I am more intellectual than extravert. But they can be compared within groups, and so this is what I did. Long story short, there is no significant correlation between personality type and being entrepreneurial. So, you nervous introverts, go for it! You have as much chance of success as Richard Branson. More detailed analysis of this and other data on personality, working style and entrepreneurshio can be found here. If you want to see how your Big Five stack up to those seen in my students, this spreadsheet has the IPIP questionnaire and instructions on how to use it. If you are an educator or researcher and use it on a group of people, I would be very interested in sharing annonymised results data with you. Let me know. Copyright © 2011-6 Rufus Scientific Ltd. All rights reserved.